I haven't yet finished telling you about my birthday trip. 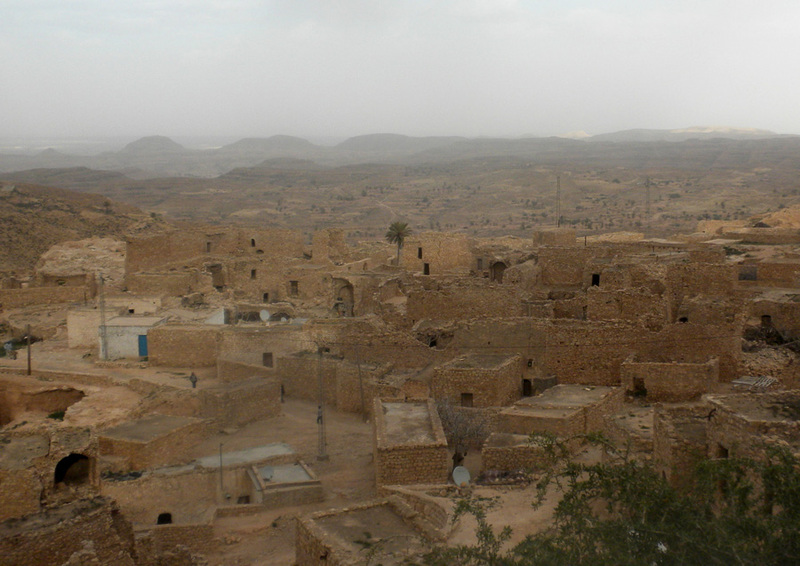 When we awoke the next morning, Tony tried to track down a 4WD vehicle to drive out to some of the more inaccessible Berber villages. The hotel employees told him he actually didn't need one. And more to the point, they didn't have one and couldn't find one. So we set off slowly and carefully, to visit the village of Chenini. 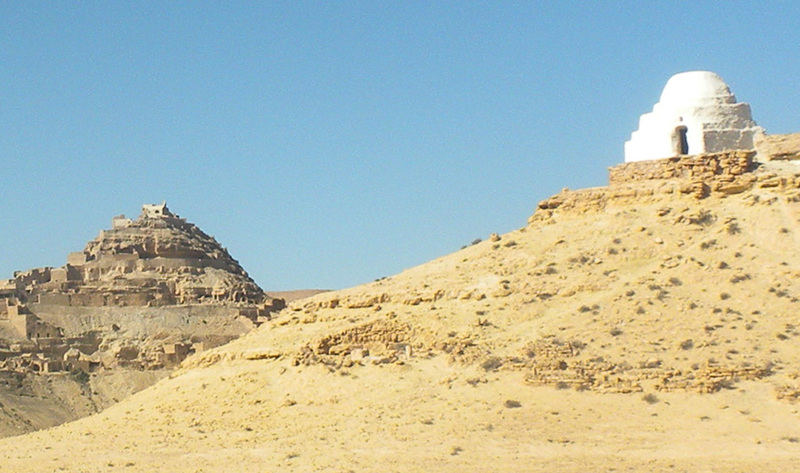 Even when one is not visiting an actual Star Wars site, that part of southern Tunisia looks a lot like Tatooine. The sandy brown color is exactly right, and there are all sorts of little dwellings that look like they might harbor jawas or sand people. The feel of Chenini was a lot like the cliff dwellings in Petra, even though Chenini is mostly just built out of those sandy brown mountain rocks, rather than being carved straight out of the mountain. It has an otherworldly feel, like an ancient alien city forgotten by time. It's still very much inhabited, though. We saw lots of people, as well as donkeys, goats, and chickens. 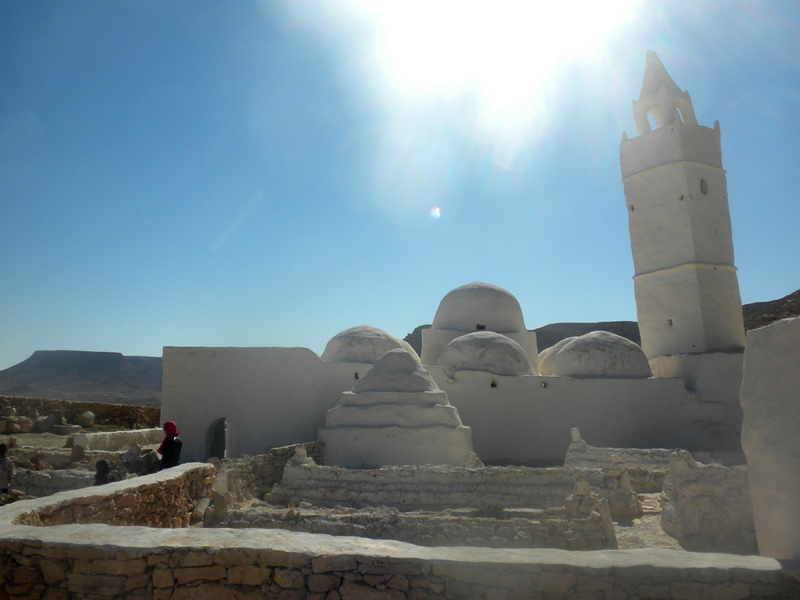 Near the village is a tiny whitewashed mosque with a cockeyed minaret, inhabited by an old man in a blue turban who is the caretaker and guide. 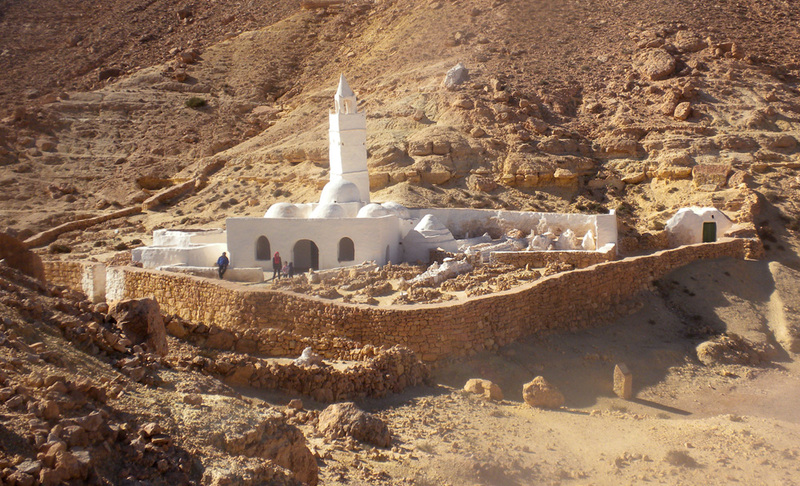 In a terrain composed of only two colors (sandy brown ground, rocks, walls and houses below and bright blue sky above), a whitewashed mosque is a dramatic and stunning site, starkly visible for miles. Supposedly, the mosque is built above a cave where seven early Christians were imprisoned by the Romans and slept for hundreds of years. During the time that they were sleeping, not only did their hair keep growing, but their bodies did as well. When they finally awoke and emerged, they were four meters tall, and during their long sleep, the world had converted to Islam. So they became Muslim themselves, and were then able to die in peace. Fortunately, we had read the story in Lonely Planet, because the man in the blue turban spoke no English. His French, however, was peppered with Italian, so we were able to catch some of what he was saying. 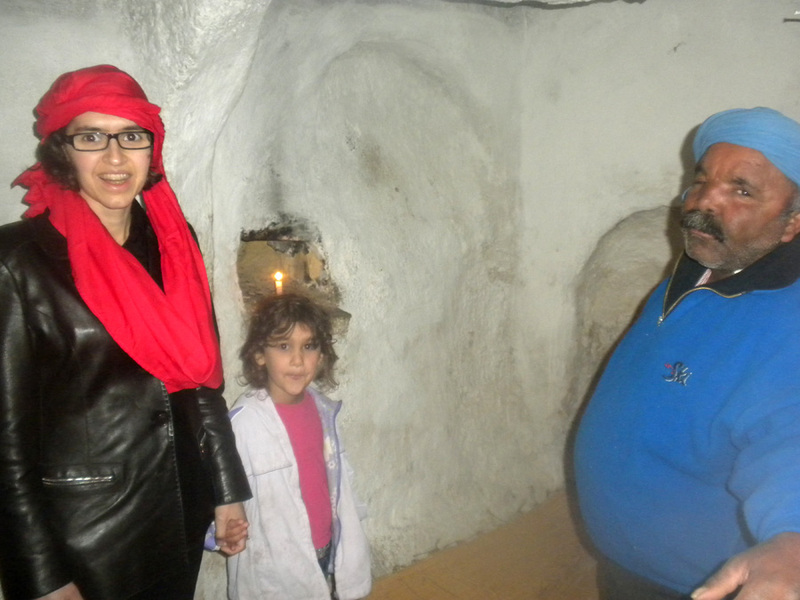 He showed us the original cave, along with the qiblah that points toward Mecca and the impressive four meter graves in the little graveyard outside the mosque. After our stop in Chenini, we started to head for home, since all the military personnel we'd seen in the south made us less than enthusiastic over being out and about after dark. Just outside the town of Sfax, which I guess is a sort of cut-off point between northern and southern Tunisia, there was the biggest military checkpoint we have seen here to date. At least twenty military and police were actively conducting searches on several vehicles. Just a kilometer or so down the road was another, smaller checkpoint. After that, we just saw the normal two or three officers at large roundabouts or intersections. Our last stop on the way home was el Jem, an old Roman city with a stunningly well-preserved Roman amphitheater. 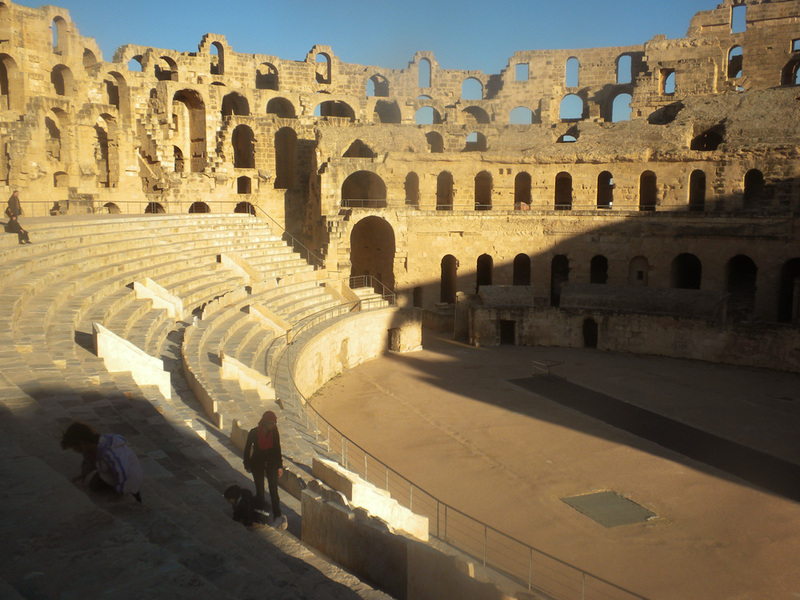 It is startling indeed to be driving down a crooked street in a little Tunisian town and suddenly see the amphitheater rise, as if from nowhere. Even if you're expecting it, as I'm sure most people are. We got in just before closing, and as usual, had the place pretty much to ourselves. 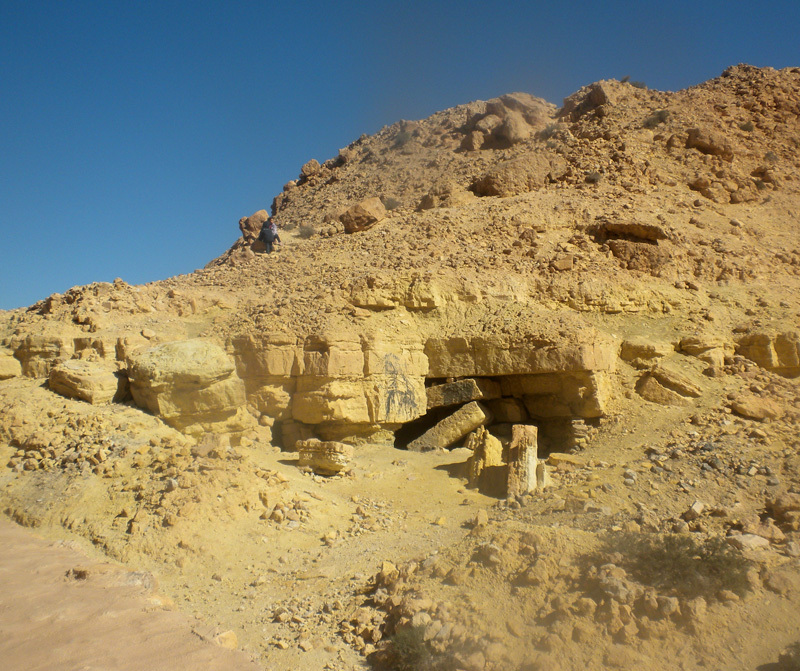 The setting sun gave a reddish cast to the towering walls, leaving the excavated lower levels in deep shadow. It was chilling to walk through them, picturing snarling lions and unfortunate Christians locked up in the still-existing cells, waiting to meet their fate under the eyes of thirty-thousand bloodthirsty spectators. It was my first time to be inside a Roman amphitheater. I was overwhelmed by the building's combination of masterful engineering, beautiful architecture, and depraved purpose. Of course I had read about the Romans and their tastes in entertainment, but somehow it was different to walk through those high arched hallways, look down into the arena, and actually picture it all happening. I guess unconsciously I had envisioned something more like my very first classical ruin, peaceful, grassy Pergamum, with its theater built into the mountainside, half lost in its own remote daydreams of Greek tragedies. In any case, Axa and Dominique had a wonderful time climbing untold stairways, discovering new rooms, and trying to get as close to the roof as possible. It really brought the stories we've been reading them about ancient Rome to life. Dominique says he wants to go to Rome so he can see more "broken things." We tried to hit el Jem's small mosaic museum on the way out of town, but our luck had run out, and the place was closed. 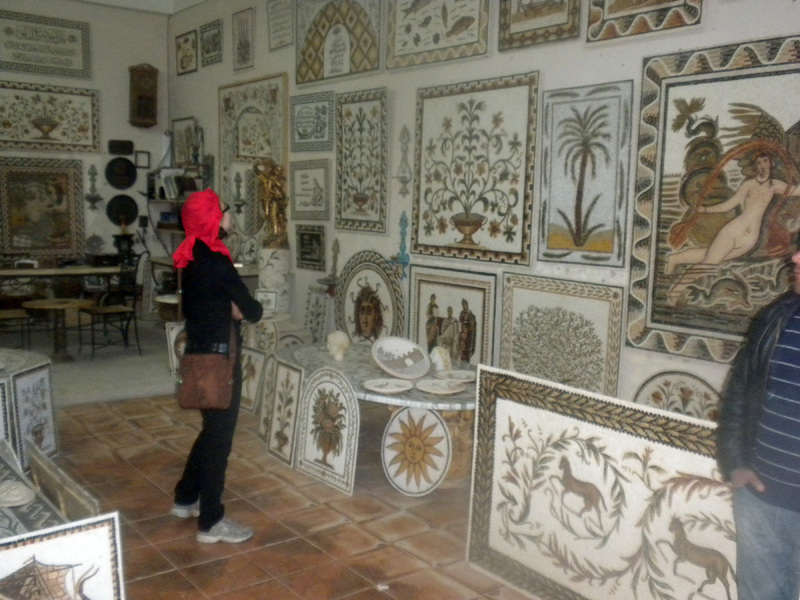 So instead, we popped into one of several modern mosaic shops on the outskirts of the city. We saw replicas of the famous mosaics from Tunisian sites, some of which Axa and Dominique recognized from the coffee table book that conveniently came with our house. Ever the enterprising homeschooling mom, I had been cherishing the idea that they could make mosaics themselves, but without having any idea where I would find the materials. Suddenly, here was my chance. We asked the mosaic artist if he could sell us some of the small stone tiles. He took us in the back of his workshop and gave us a little mini-tour, explaining all of the steps to making a mosaic. Then he gave us different colored tiles out of each of the large bins he had in the back.  Most of the stone comes from various parts of Tunisia, although the white marble that forms the background of the mosaics is imported from Italy. So for the past couple of days since then, the children have enjoyed making designs with their mosaic tiles. All of us except Tony fell asleep on the way home, so we missed his sighting of what he described as a three-foot long black and green lizard without a tail. If anyone has any ideas about what Tunisian animal might fit that description, we'd love to be enlightened.